Via Lago Catering provides the best of both worlds - the level of intimate attention possible from a privately owned and operated caterer, and the size and ability to provide variety and scope for all catering needs. Their signature style demands that food be fresh, flavorful and creative, while matching a client's personal tastes and preferences. 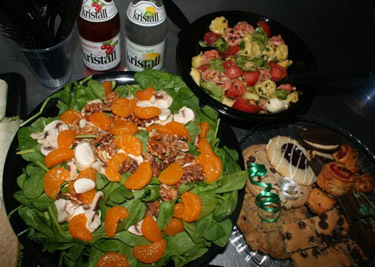 Catering is owner Marcia Berlinsky's specialty. With over fifteen years of experience, Marcia provides guidance, designs menus, and takes care of every hidden detail so clients can relax with confidence that the job is being handled with an expert touch. Together with partner, Alan Jick, and an excellent culinary staff, Marcia brings personal care, versatility, and attention to every event, whether it's a smaller gathering at home, or hors d'oeuvres for 600 at a museum party.